Super red pedal quad from Falk. With a chunky, sturdy design featuring high handlebars, fully enclosed drive chain and front and rear mudguards. Dimensions 84L x 50W x 44H cm. Maximum weight 30kg. Recommended age 3 years +…. 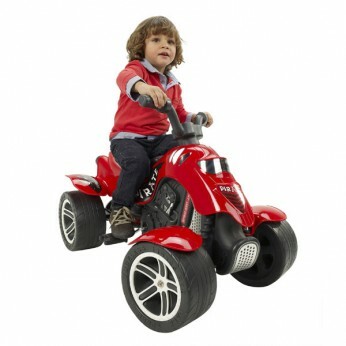 The Falk Child’s Pirate Quad Bike is a fun, chain pedal driven, sit and ride quad bike. Sturdy construction and comfortable seating position with moving wheels means this toy offers hours of imaginative and creative role play. Fun chain pedal driven quad; Extra large wheels; Mudguards; Sturdy construction whilst remaining comfortable. Height to seat: 45cm. General information: Size H56, W50, D84cm; Weight 6kg; Maximum user weight: 30kg; Some assembly required; For ages 3 years and over; EAN/MPN/UPC/ISBN: 3016200006008. WARNING(S): Not suitable for children under 3 years old. Only for domestic use; To be used under the direct supervision of an adult. Protective equipment (helmet, knee pads and elbow pads) should be worn, not to be used in traffic. * . This toy costs approximately £59.99 (for the latest and best prices make sure you check our retailer list for the Pirate Quad Red above). In our review of Pirate Quad Red we classed it as being suitable for ages 3 years, 4 years, 5 years but recommend you check the manufacturer specific advice before purchasing.